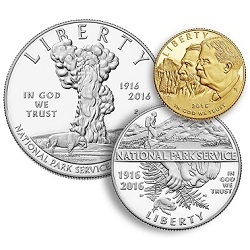 This week’s U.S. Mint sales report has arrived, giving us our first look at sales for the new National Park Service Commemorative Coins and the Betty Ford First Spouse Gold Coins. Last week’s release of the National Parks Service (N.P.S.) 100th anniversary issues constituted one of the biggest launches of 2016. Six new coins and a three-coin Proof Set joined the Mint’s roster of available products, and the Mint marked the occasion by hosting a gathering in front of the Lincoln Memorial that included U.S. Mint and Park Service officials and a Teddy Roosevelt mascot. Despite the fanfare, initial sales of the coins were a bit lackluster, posting totals that were noticeably lower than last year’s U.S. Marshals Commemorative Coins debut. The N.P.S. coins may not have had a blockbuster debut, but they did sell well enough to claim each of the top five sales positions for the Mint this week. The highest-selling item was the N.P.S. Silver Proof dollar, which sold 19,518 coins during this period. Second place went to the Proof half dollar with 15,416 units sold, while the Uncirculated half dollar nabbed third with 9,001 pieces purchased. Fourth and fifth places went to the Uncirculated silver dollar and the three-coin Proof Set, which sold 8,647 coins and 7,886 sets, respectively. Also new this week were the Betty Ford First Spouse gold coins, which sold 960 Proof issues and 605 Uncirculated pieces in the days following their debut. These numbers are down compared to the first week totals posted by the Patricia Nixon issues on February 25, but are not inconsistent with the demand we’ve seen for recent First Spouse offerings during their first days of availability. Finally, several high-profile 2015 issues were removed from the report this week, meaning last week’s totals for the items will stand as final. Those items are listed on the table below with sales figures. The following statistics show total sales for the listed items through March 27, 2016. The first numerical column includes information from the Mint’s March 20 report, the second column displays this week’s updated numbers, and the third column tallies the increase in sales over the last week. Items new to the report are listed in bold. For more information on any of these products, please visit the U.S. Mint’s online product catalog.